Shirin Ebadi is the first Iranian to havebeen awarded the Nobel Peace Prize. She was awarded the Nobel Peace Prize for her outspoken campaigns for human rights and democracy in her own country of Iran. 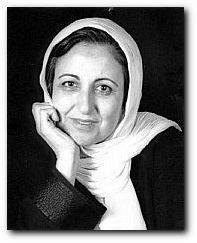 Shirin Ebadi was born in the city of Hamedan, Iran in 1947. Her family were academics and practising Muslims. Shirin Ebadi gradutated from Tehran University and went onto become Iran’s first female judge, serving from 1975. However after the Islamic revolution of 1979 she was forced to resign, as women were no longer allowed to serve as judges. During a long period of unemployment Shirin wrote many books and articles on issues of human rights. In 1992 Shirin finally obtained a lawyers certificate enabling her to set up her own practice, she has defended many victims of child abuse and murder. Shirin Ebadi has also established two non-governmental organizations in Iran, the Iranian Society for Protecting the Rights of the Child and the Centre for the Defence of Human Rights. Shirin has a quite and soft spoken nature but this belies her stubborness andunwillingness to besilenced on politically sensitive legal cases. Her work for human rights in Iranhave won her admiration and respect from humanitarian bodies across the globe. However in Iran her promotion of human rights issues and politically sensitive issues have led to clashes with the conservative judiciary. In 2000 she was given a suspended jail sentence for promoting evidence that prominent conservative leaders were instigating attacks on pro reform leaders. “She is a popular figure in Iran and also she’s a key figure in reformist movement and like many other key figures in the movement she’s been harassed by the conservative forces who control the judiciary, ” according to Ziba Mir Hosseini of the School of Oriental Studies in London, a friend of the lawyer. Shirin Ebadi is currently married with two children. As well as the Nobel Peace Prize she has been given other awards as well. An official Human Rights Watch observer, 1996. The selection of The Rights of the Child as Book of the Year by the Culture and Islamic Guidance Ministry.